If recent trends are any indication, bathrooms should be renamed shower-rooms. Busy families not only prefer showers to tubs for their daily bathing. They also are investing careful thought and money to design and equip them for exceptional beauty, functionality and safety. I interviewed leading plumbing supply showrooms and Twin Cities bathroom designers for their best shower advice. Here’s what they shared. Small bathrooms can only accommodate small showers. Shower size also may be pre-determined when replacing a tub/shower. However, small showers often can be enlarged during remodeling. This especially applies if you are willing to reposition fixtures or move a wall. Many homeowners gain shower space by jettisoning a jetted tub. Out with the noisy Jacuzzi that seldom gets used. Generally, larger showers are more accessible and comfortable than smaller ones as long as they are shielded from cold drafts. Larger showers also are great if you occasionally share the space with a partner and have more than one showerhead. 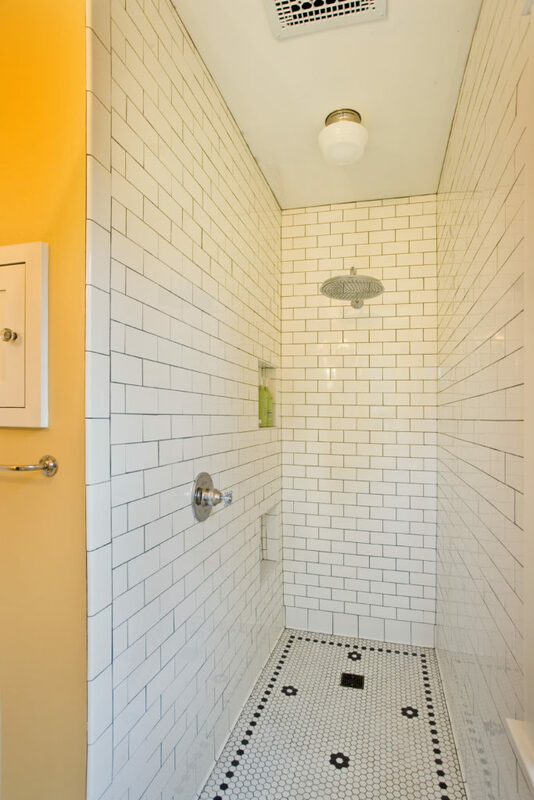 Designer Lisa Stoll from Sparrow & Stoll considers 3X4 feet the minimum for a shower that gets regular use by tall people. “While those larger showers are very nice, sometimes we just don’t have enough room for them,” notes JB from APEX. He considers 3×3 feet an absolute minimum. Large shower with glass enclosure. Curbless showers eliminate the barrier between the bathroom floor and the shower pan for unobstructed wheelchair access. 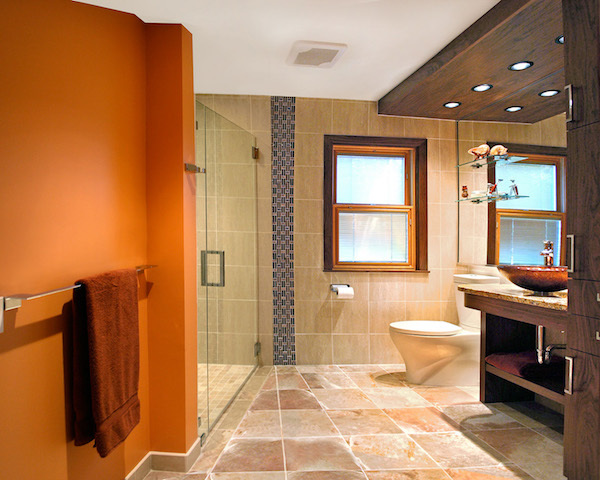 It requires the shower floor to slope away from the shower door or entry, usually with the drain along the far wall. The catch is that the main bathroom floor needs to be a bit higher to stay dry. That can create a transition issue between the bathroom and the adjacent hall or room. Preformed shower bases speed installation and reduce costs, but they limit shape and drain placement. With the waterproof membrane approach such as Schluter Systems, custom tile showers can accommodate any footprint and drain configuration. Tip: When choosing a drain, try to mimic the shape of the fixtures. For instance, a square drain would coordinate better with a big square rain showerhead than a round one. Square or rectangular drains also are much easier to tile around. 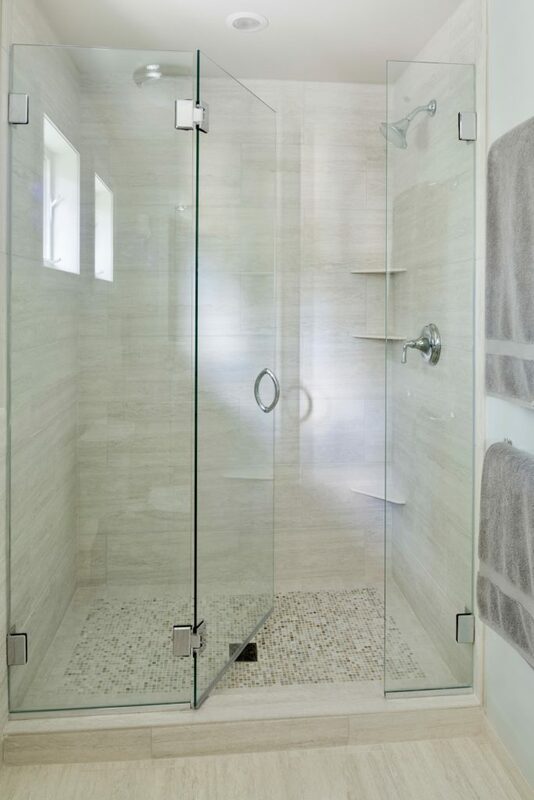 With fancy custom tile designs so popular today, it’s no surprise that frameless, clear glass enclosures are a top choice among remodeling clients. Although clear glass is higher maintenance and provides no privacy, it makes any bath look larger and showcases one’s tile investment. To avoid water spots and soap buildup, Pappas suggests treating the glass with Rain-X, rinsing the surfaces with a hand shower and drying surfaces with a squeegee. Alternatively, Stoll specifies seeded glass to obscure water spots. Tile is the preferred shower surface because of its design and installation flexibility. Horizontal patterns are more tradition, vertical more contemporary. Stoll notes that horizontal patterns also are more relaxing, adding to the spa feeling that that so many people want to achieve. Pappas notes that a mid-wall, horizontal accent strip not only breaks up a tile surround but also helps bathers maintain balance by orienting them after they open their eyes or turn. “Think of it like a horizon line,” she explained. Many designers prefer the updated look of larger tiles, but subway tile remains a classic for period decors. Designer DeAnne Koppendrayer of Designs by D favors 12×24 tile on the shower walls, installed in a subway tile pattern or straight stack depending on the look of the room. Koppendrayer also encourages clients to integrate tile accents with countertops. “Whatever I choose for the vanity top I use it to cap the shower knee wall, the curb, the bench and the corner shelf. 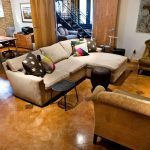 It helps to tie the whole room together and makes it easy for the tilesetter to pitch the surfaces for drainage,” she said. Meyer, too, prefers large format tile. “The bigger the better for fewer grout joints,” she said. “Horizontal pattern is considered transitional because it can be tradition or contemporary. Vertical pattern is contemporary.” If large tile is used for the base, she often carries it up the wall. Meyer specifies porcelain tile rather than natural stone because it is easier to maintain. At one time, showerheads would reliably emerge from an interior sidewall, perpendicular to the door. Now they also may extend down from the ceiling or even be installed flush with the tile ceiling. This placement freedom owes at least part of its success to flexible plastic PEX tubing that allows plumbers to effortlessly snake supply lines practically anywhere. However, it still is preferable to avoid installing plumbing within exterior walls where freezing can be a problem. If you must install fixtures on an outside wall, build out the framing to maintain effective insulation behind the supply and waste lines. Showerheads offer a variety of water patterns that change the force, footprint and feel of the spray. Showrooms such as Ferguson’s and Aspire have shower walls with functioning showerheads so you can see difference and at least feel it on your hand. They are only plumbed with cold water and offer no privacy so don’t count on a full shower experience. To conserve water while maintaining a decent shower experience, look for the WaterSense badge. These fixtures use 20 percent less water than standard showerheads without compromising performance. Hand showers have become ubiquitous in today’s showers and for good reason. Hand showers are most effective when mounted on a vertical bar so both the height and the angle of the spray are adjustable. A lower position is ideal for small children, pet washing, and elderly or disabled users who may need to sit when bathing. If the shower has a bench, the hand shower wand should reach a bracket within reach of the seated user. If you plan to use a vertical hand shower bar as a grab bar, be sure that it is rated for such support. Many aren’t. Some hand showers operate off diverter valves that shift the water supply from the main showerhead to the auxiliary head. Hand showers with separate controls are better because they allow you to use both heads at once. When installed opposite or at a right angle to the main showerhead, it can eliminate cold-side showering and increase comfort when sharing. 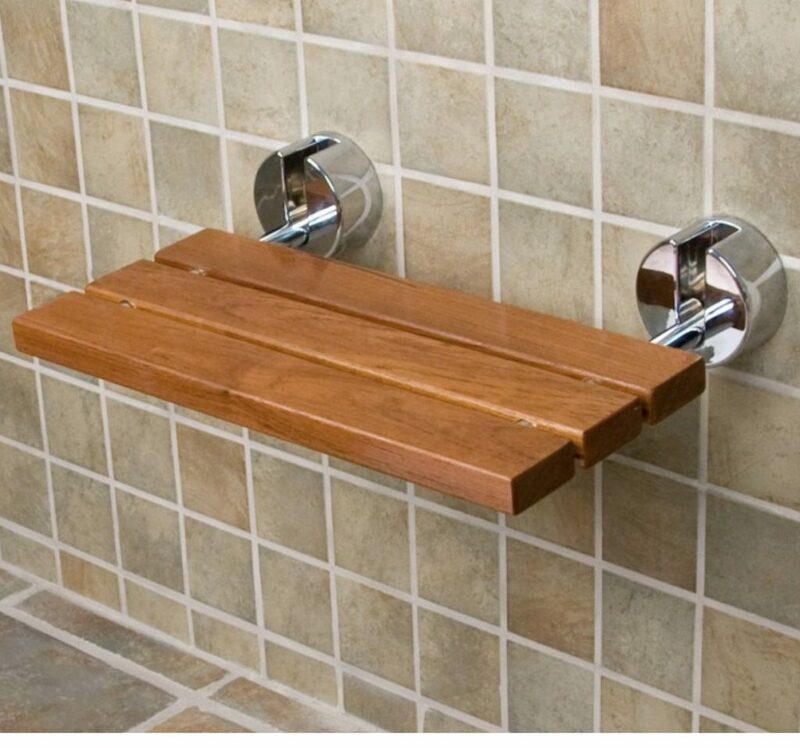 All of the designers recommend benches in showers for accessibility, safety and convenience if space allows. Integral tile benches should be sloped slightly for drainage. When space is limited, consider a stylish fold-down teak seat. Most designers are not keen on freestanding seats because they are less stable than fixed ones. Even the smallest shower can incorporate a toe rest (think low shampoo niche) for use when shaving legs. Simply position a small niche a foot above the shower pan. Include a vertical grab bar for stability. Shower controls often align vertically with showerheads to create a balanced look and simplify plumbing. However, it’s important to be able to reach the controls to turn on the water without getting wet. For a large shower, consider positioning the controls within reach of the door. Accessible controls and low footrest niche. Shower controls have temperature and pressure balance features that can be set to prevent scalding when someone flushes a toilet or goes full hot. Make sure the plumber checks the high temperature limit during installation. The most sophisticated shower controls feature digital displays that enable individual users to set (and see) their preferred temperature for an ideal shower experience. Perryman says parents with young children like the Delta Temp2O fixtures because they display the temperature digitally and have an easy to understand color indicator (blue for cold, purple for warm and red for hot). Stoll notes that the color displays also are good for people with poor vision. But Pappas says many of her clients “are not into gizmos.” Most people know where to position the lever for their preferred showing temperature,” she said. A grab bar should be positioned vertically where you can hold on comfortably when entering and leaving the shower. Stoll says a second horizontal bar is helpful along the long wall perpendicular to the showerhead. Avoid configurations where the bar and hand shower hose would conflict. You should be able to grasp the bar without having the hose in the way. Most remodelers install solid blocking behind shower surfaces to anchor future grab bars, but designers suggest you don’t wait to incorporate this proven safety feature in your new shower. Just be sure to coordinate the bar design and finish with the other fixtures so it looks like it belongs. Hot showers produce enormous amounts of moisture in a small confined space. Many designers turn this into a plus by installing steam generators for a spa experience. Whether you have a steam shower or a regular shower, a properly sized exhaust fan is essential to remove excess moisture and avoid mold. For maximum effectiveness, the fan should be installed just outside the shower. Many bathroom fans have become so quiet that manufacturers suggest they be controlled by timer switches. This enables you to set the fan to run after you finish a shower and never forget it on. Stoll notes that the larger the bathroom the longer the fan should run. “I tell clients 20 minutes minimum,” she said. When choosing a steam shower, install the steam generator where it will be quiet but accessible for servicing. 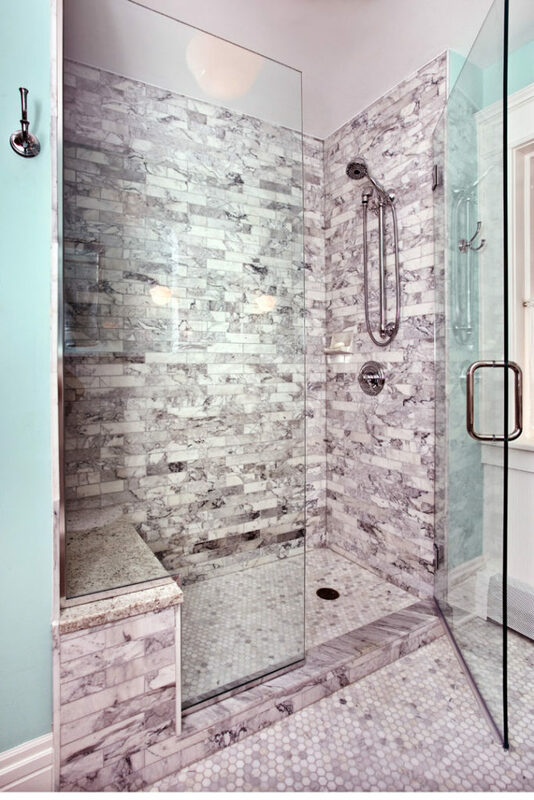 Many of the designers agree that there still is a place for prefabricated shower enclosures and shower curtains for basement or secondary showers. Shower curtains provide privacy and can add a splash of color to a bathroom with plain surfaces. And panelized shower enclosures are affordable and easy to clean. If your budget is tight, it might make more sense to splurge on the new kitchen and skip the fancy tile and glass in the bathroom,” one designer observed.